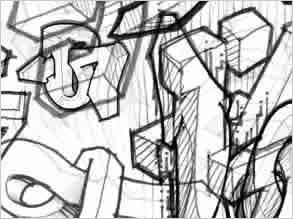 This new set of Graffiti Photoshop Brushes is coutesy of my friend Craig, who I've been working with the last few months, he doodles and created superb 3D Graffiti, minute I saw it I knew it had to be featured on here. He also designs fonts check out his Type Foundry website for more of his cool work. The new free Graffiti Photoshop brushes set features eight new photoshop brushes, the sizes of these are pretty big the photoshop .abr file weighs in at 266k (zipped) I have more of these, will probabally swap the files so you guys get the new versions in a couple of months.